In England, sometime in August of 1944, the prospects of a second "big jump" reached a fever pitch. To those of us who had made the first jump, the waiting wasn't easy. How could we prepare mentally for this second combat jump? 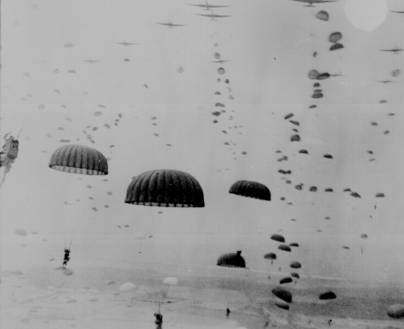 Would the next jump be even worse than the one at Normandy? These were great years for me. I was in my early twenties, and these were history-making times. Above all, I was a part of the action. A paratrooper! A 502nd paratrooper! A 101st Airborne paratrooper! That's about the best there is! I had been prepared well for my twenties by my mother, by her religious teachings, and by my dad with his common-sense approach to everything, regardless of its danger. So I walked right through those days of August and September, looking straight ahead and never back, right out the door and over Holland. It was Sunday, 1300 hours (1 p.m.), on September 17, 1944. The sun was glorious all the way from Welford Airfield just northwest of London to our drop zone in big open fields in the center of a triangle with borders from Best to Zon to St. Odenrode, Holland . . . .